Back in the 70's, Martha, the young daughter of a dear friend, gave me this recipe. Never inquired whose recipe it was or how she discovered it at her young age, but what a gem it is! When company comes, Martha's coffeecake is always on the menu for breakfast, then I watch while everyone goes over and cuts slices of it all day long. It's addictive. 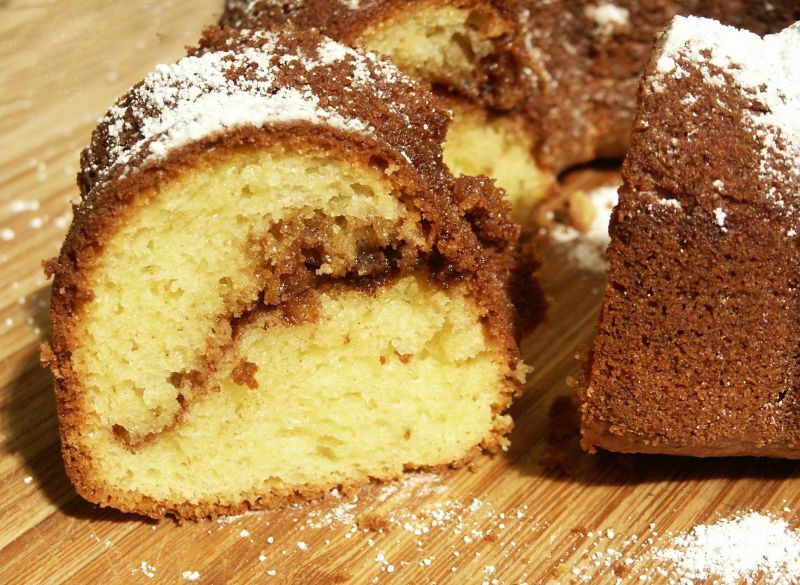 Martha is now a grandmother and I wonder if she still makes this coffeecake. Must remember to ask her, she's on Facebook with me. You can make this in mini bundt molds as well and for this post I made it in two eight inch molds instead of one large bundt mold. That way you can freeze one. 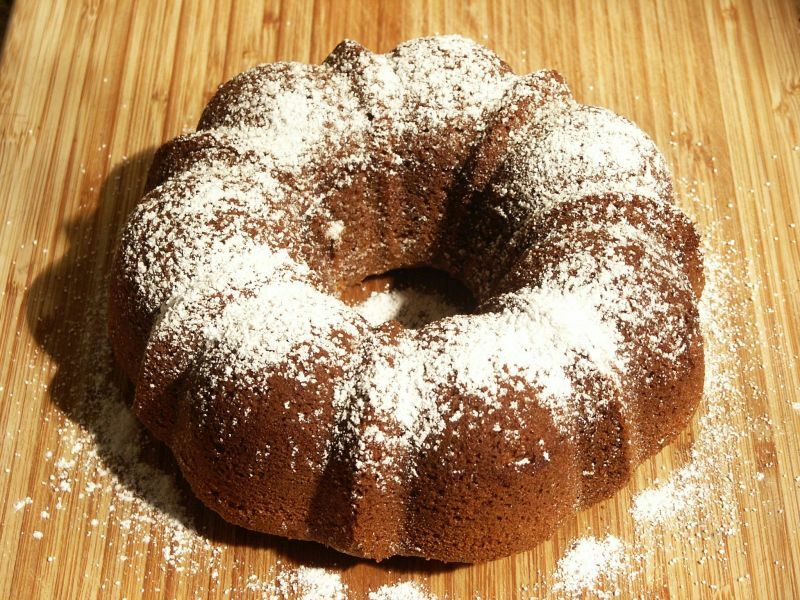 I realize many of you rarely use box cake mixes and there are any number of delicious coffeecake recipes made from scratch, but honestly, this recipe is a great time-saver, it's beautifully moist, with that lovely cinnamony crunch in the middle and you'll be amazed at the raves you'll get. Such a simple, old fashioned recipe, but those are the best kind. Mix all ingredients except brown sugar and cinnamon. Generously butter a bundt pan (or two small bundts...or even the mini bundts...just watch your baking time.) and sprinkle with dry bread crumbs, knocking the bundts on the side to remove excess crumbs. Pour half of the batter into the pan- or divide between 2 small bundt pans. Mix the cinnamon and brown sugar ( Note: I always make more than called for in this recipe) and sprinkle on top of the layer. Cover with remaining batter and bake 350 for 1 hour. 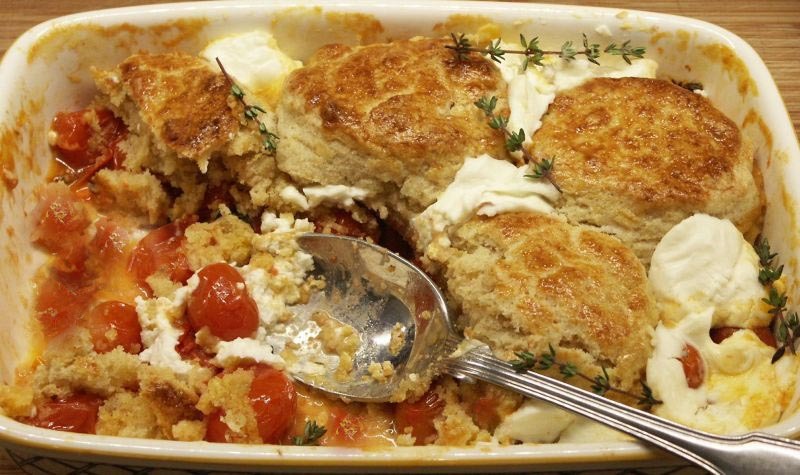 A savory cobbler....topped with some delicious biscuits. Serve it for lunch or a side dish with dinner. The only thing I'd change is next time I'd add some shallots or green onions to the tomatoes while they were on the stove. This dish can be cooked and baked in one oven-proof saute pan. (Aside from the biscuit dough.) But I poured the tomatoes with all their juices into the casserole and topped with the biscuits. It just made presentation and serving a tad prettier. Note: Biscuits need to be in the freezer a couple hours before baking. For the biscuits: Combine both flours, the cornmeal, baking powder, sugar and salt in a large bowl. Add the cubed butter and with your fingers, work the mixture until the butter pieces are all pea sized. Add the buttermilk and lightly toss to distribute. Pour the mixture on a clean surface and with the heel of your hands, toss and squeeze the dough it holds together. Do not overwork, you should still see pieces of butter. Press the dough into a disk about 3/4 inches thick. Cut out biscuits, place them in a pan and place in the freezer for two hours. Combine the tomatoes, olive oil, 2 sprigs of the thyme and salt in an oven proof saute pan. Cover and cook over high heat until the tomatoes begin to soften. Uncover and cook until all the tomatoes burst slightly. Top with the frozen biscuits. Make an egg wash with an egg yolk and 1 tablespoon of heavy cream. Brush the biscuits with it. Place in oven for 25 minutes. Remove from the oven and dollop the goat cheese over any exposed tomatoes. Place back in the oven, increase temperature to 475 and bake another 10 minutes or until nicely browned. Serve at room temperature with some extra sprigs of thyme. 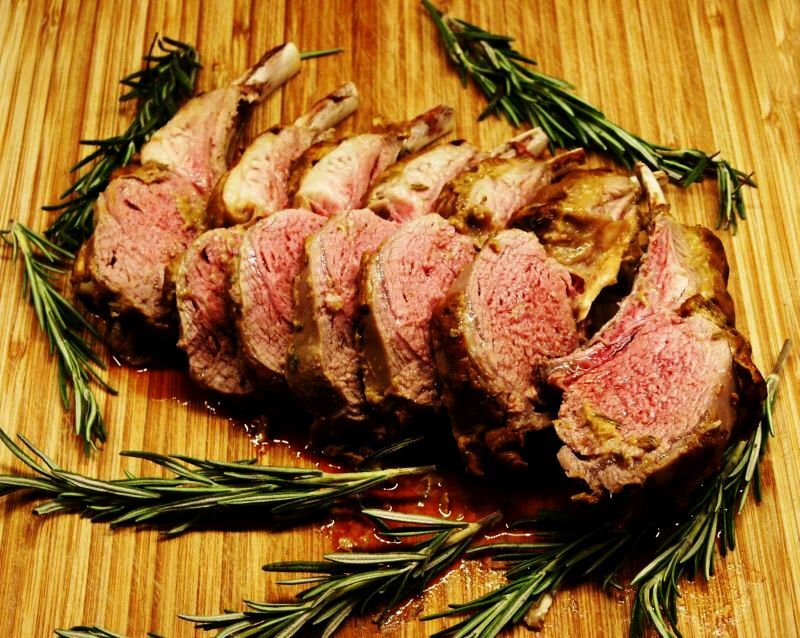 There are slews of recipes for rack of lamb everywhere and Ina Garten has made several versions over the years. As she is one of our favorite chefs, I invariably turn to her for ideas. I make her Rack of Lamb Persillade which we love, but the last time my daughter was home, we tried this recipe for the first time. Daughter Tracy loves lamb....orders it often when we go out to dinner (although it's gotten sooooo pricey), so I knew she'd love this version. So simple to make and really, if you follow her guidelines, it's a no-fail recipe. I served a salad and some delicious roasted sweet potatoes with it. In the bowl of a food processor fitted with a steel blade, process the salt, rosemary, and garlic until they're as finely minced as possible. Add the mustard and balsamic vinegar and process for 1 minute. Place the lamb in a roasting or sheet pan with the ribs curving down, and coat the tops with the mustard mixture. Allow to stand for 1 hour at room temperature. Roast the lamb for exactly 20 minutes for rare or 25 minutes for medium-rare. Remove from the oven and cover with aluminum foil. Allow to sit for 15 minutes, then cut into individual ribs and serve. Note: "Frenching" refers to scraping the meat off the tips of the bones. Ask your butcher to leave 1/8 inch of fat on the meat. Wonderful colors and flavors in this salad, exactly what we expect from Ottolenghi. What I think you'll really appreciate is this is a super alternative to potato salad or even a tossed salad for a picnic or pot luck. Easy to make for a crowd. The recipe says it serves 4, but I thought it went farther than that. Especially for a side salad. Note: the chickpeas need to soak overnight. 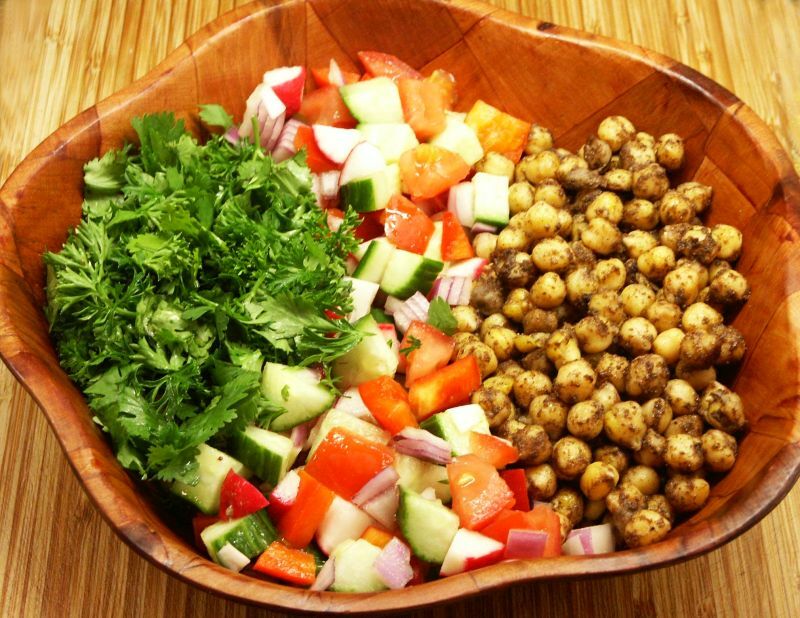 Soak the dried chickpeas overnight in a large bowl of water with the baking soda. The next day, drain cover with water twice the volume of the chickpeas and simmer for an hour or until tender. Drain. Dice the tomatoes, red pepper, cucumber, radishes and onion. Mix in a bowl with the cilantro and parsley. Mix 5 tablespoons of the olive oil with the lemon juice, zest, vinegar, garlic and sugar and mix well to form a dressing. Season with salt and pepper and pour over the salad, tossing lightly. Mix together the cardamom, cumin, allspice, some salt and 1/4 teaspoon of sugar in a bowl and toss in the chickpeas. Shake to cover well. In a frying pan, heat the remaining olive oil and fry the chickpeas for 2-4 minutes , gently shaking the pan so they cook evenly. 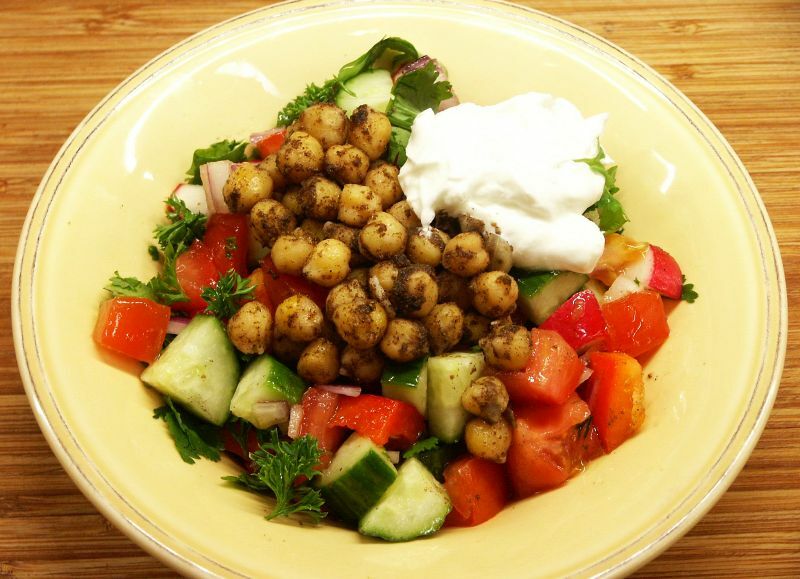 Divide the salad among 4 plates, spoon the chickpeas on top, keeping the edges of the salad clear. Optional: add some Greek yogurt, stir it in to make the salad creamy. Fennel is one of my favorite vegetables....love it roasted and make it frequently. One thing I don't like much is raw fennel in salads...the anise flavor is more pronounced, which I don't particularly care for. But caramelized, it's divine. We all have our little quirks. When I saw this tart, I knew I'd love it and, cut into smaller pieces, it would also make a nice appetizer. 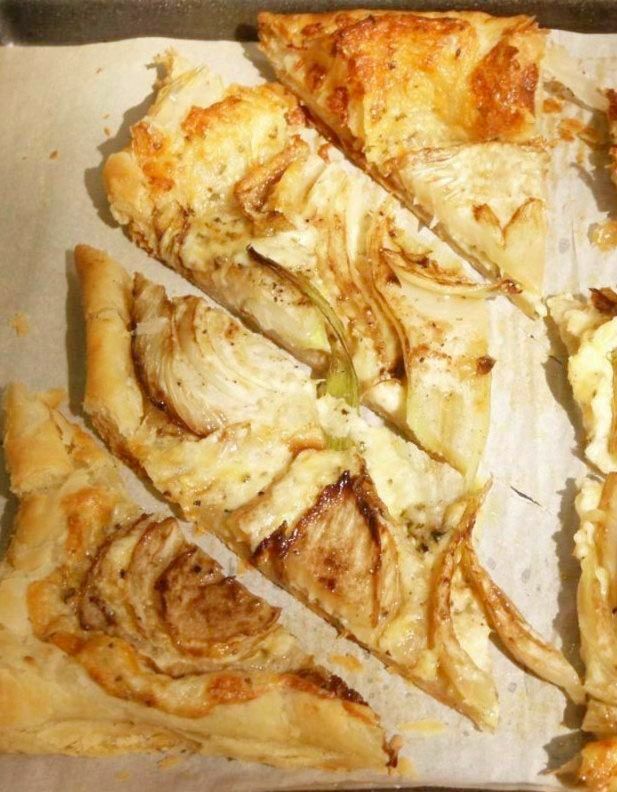 I made it for lunch, left the puff pastry whole and placed whole fennel slices on it, then sliced it afterwards. You can do it my way or follow the instructions below. Preheat oven to 400°F. Thinly slice fennel heads into 1/2 inch slices (lengthwise) and cut each piece in half. (I left them whole.) Brush each piece of fennel with oil and season with salt and pepper. Heat a grill or grill pan over high heat and lightly grease. Grill fennel for about 3 minutes on each side or until nicely charred and softened. Remove from heat and allow fennel pieces to cool. In a small bowl combine Gruyere, mascarpone, oregano, red pepper flakes, and lemon zest. 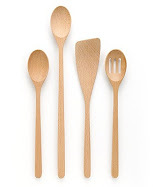 Season with salt and pepper and mash together with the back of a fork until fully combined. Cut your puff pastry into rectangles. (I left my puff pastry whole.) Spread a small amount of the cheese mixture over each piece of puff pastry, leaving the outer 1/4 inch perimeter bare. Top each rectangle of cheese spread puff pastry with a piece of grilled fennel and gently press down. Place each tart onto a baking sheet, lined with parchment, and lightly season with salt and pepper. 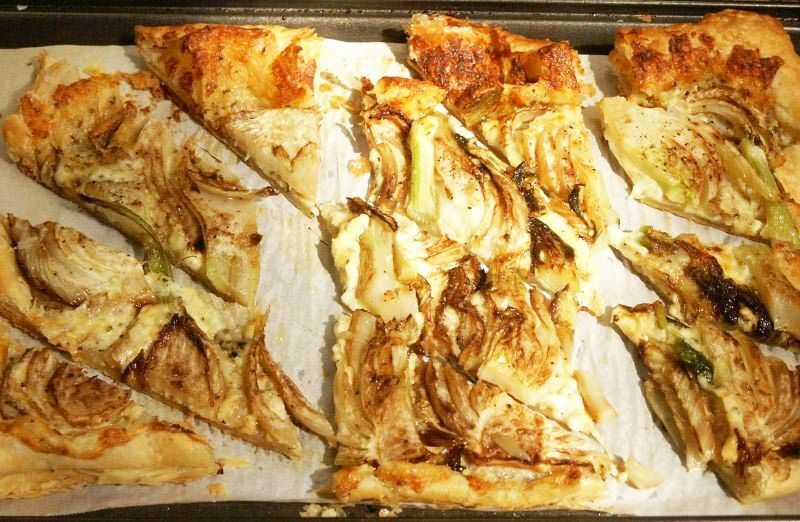 Bake for 15 to 20 minutes or until the fennel begins to caramelize and the puff pastry turns golden brown. Allow to cool for 5 minutes before cutting and serving. 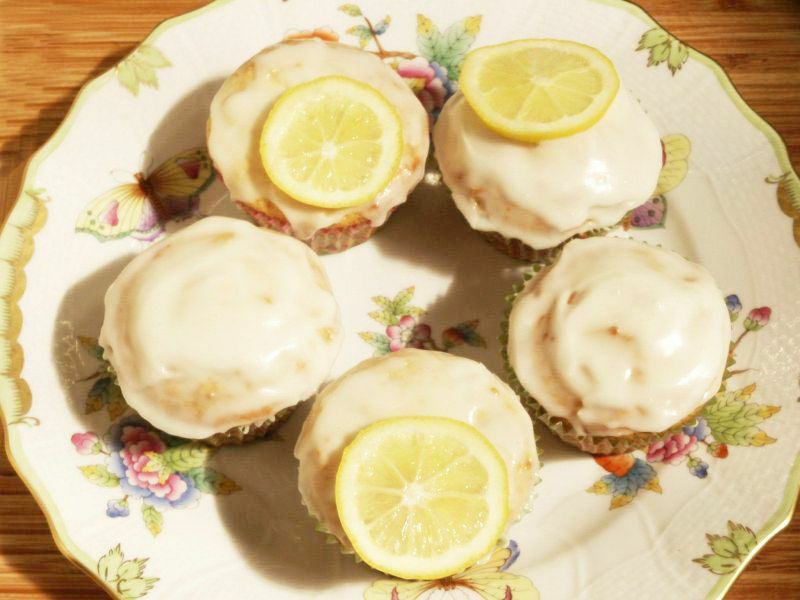 These muffins are divinely spring-like, the ricotta addition makes them moist and the glaze is the perfect finishing touch. Preheat oven to 350. Line muffin pans with 18 paper liners. In a stand mixer, cream the butter, sugar, salt and zest until light and fluffy. 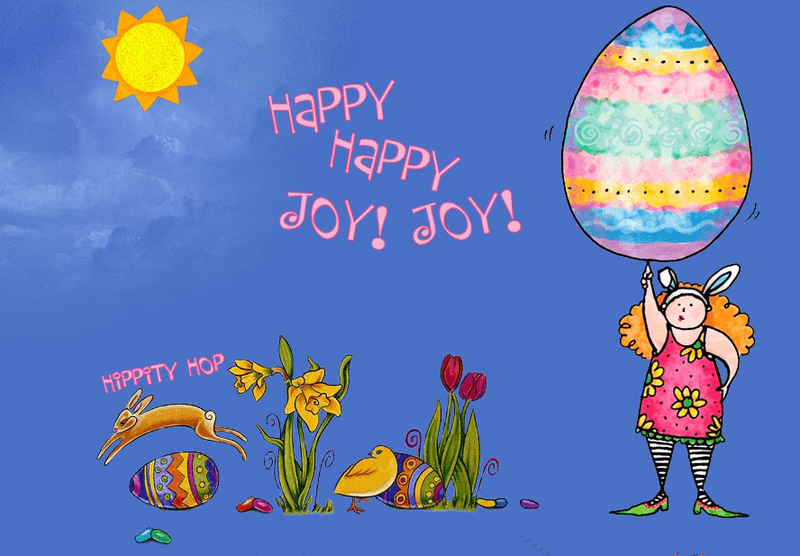 Incorporate the eggs slowly, one at a time. Scrape the sides of the bowl well. Slowly pour in the oil, the maple syrup, lemon juice and the vanilla. Add the dry ingredients and the ricotta. Do not overmix. Fill muffin cups about 3/4 full and bake for 18 minutes (mine took longer...better to let them brown on top) until muffins barely spring back when touched. Make the glaze by sifting the powdered sugar and adding the lemon juice and cream. Spread the glaze on each muffin. Better to do this when they are just slightly warm.